ZOMG! Nail polish that reacts to magnets to create awesome designs! Why haven't I heard of this before?! I rarely paint my nails (it just never seems to stay on more than 12 hours) but this has me seriously considering a trip to Sephora. 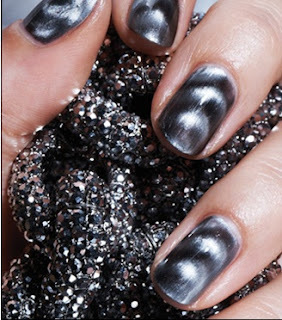 The relatively new concept available from a couple of brands adds metal to the polish. Immediately after a generous layer is painted on the nail, a magnet is held directly above the wet polish and a pattern emerges. Find out where to get it and watch how to apply after the jump. From what I've seen, the two best brands are Nails, Inc and LCN. London-based Nails, Inc. offers two colors a purple and a chrome. A third is available in gold, but apparently, doesn't work as well as the other two. The cap has a magnet built in that, when held above, produces a somewhat undefined stripe effect. LCN offers a number of colors which don't seem to be as rich as those sold by Nails, Inc but the magnets have a more pronounced effect. (Look at Vampy Varnish's review for detailed photos featuring the colors.) 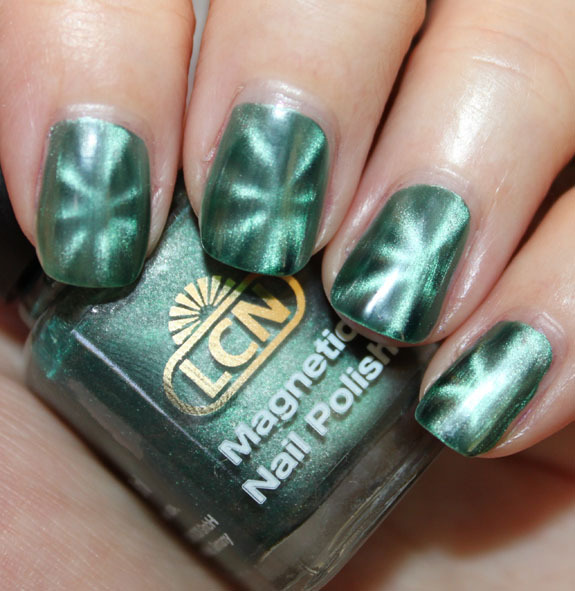 Unlike Nails, Inc., LCN sells the magnets separately. The starburst magnets are definitely the coolest of the bunch. I bet you could get extra crafty and create your own magnets after a quick trip to the hardware store for your own unique patterns like polka dots or plaid. That is super cool! Perfect manicure for geek girls!